New research shows the extent of the ‘trust deficit’ between corporate action on the Sustainable Development Goals (SDGs) and millennials’ expectations. Businesses must act to close this gap, says Corporate Citizenship’s Nana Guar. Rebuilding trust between business and society has been high on the agenda of many corporates in recent years. Over the last decade, major corporate scandals have rocked many sectors, from oil and gas, to banking and finance, to apparel, to pharmaceuticals to name a few. Public cynicism in business is nothing new. However, the stakes are getting higher as stakeholder expectation around transparency and corporate responsibility (CR) to ‘do good’ increase. These expectations have been enshrined in the Sustainable Development Goals (SDGs), the UN’s set of 17 Global Goals, which set priorities for sustainable development through to 2030. Following the biggest consultation process in UN history, lasting three years and involving 83 national surveys and over 7 million people, world leaders from 193 nations agreed to the Global Goals – in partnership with non-profits and business. A notable feature of this set of global ambitions is the call to action for business to play an active, if not transformative, role. But are they living up to this expectation? Corporate Citizenship set out to find out. One year following the universal adoption of the Global Goals we canvassed a wide range of opinions – from CR and sustainability practitioners to non-profit and civil society leaders– to get their views. We also broadened our research to find out what the so-called generation of millennials think those born between the early 1980s and 2000. Our survey sample, whilst smaller than the UN’s, represented a diverse range of over 250 millennials from 37 different countries, who are knowledgeable about the SDGs. The results are interesting and challenging. We found a shockingly large ‘trust deficit’, the gap between the hopes and expectations of millennials and the reality of what business is doing today. Below are a few highlights. The full research paper, Advancing the Sustainable Development Goals: Business action and Millennials’ view, can be found on Corporate Citizenship’s website. 81 per cent of millennials said they believed that the private sector has a very important role to play in achieving the Global Goals. This demographic is arguably set to be the most important for business as they make up the largest generation alive. Millennials are expected to account for 50 per cent of the global workforce by 2020 and they are re-shaping spending and consumption patterns whilst shaping the global economy as they enter into their prime spending years. 80 per cent said the most effective way for business to contribute to the Goals is by creating new business models and partnerships. In other words, corporates must move beyond ‘CR as usual’ and challenge conventional approaches to creating social benefits. However, there is scepticism that corporates will step up to this challenge. About two-thirds believe that ‘businesses will prioritise short-term profit ahead of longer term sustainability’. This trust-deficit reflects a broad view that one year on, most businesses are not engaging with the Global Goals in a game-changing way. Granted, it’s still early days, and many are still working out the practicalities of how to contribute to the Goals. A separate Corporate Citizenship survey of CR and sustainability practitioners found that a majority of companies are only at the exploration stage and are not yet taking real action. We have seen a number of companies respond to the SDGs with welcome announcements and promising intents – and that’s a positive sign. We have also seen more infographics and tables mapping the SDGs against company activities or material issues. Whilst this is a good start, it’s not enough. Companies must go beyond simply putting together another reporting framework, where they list what they are doing and retrofit that to the Goals. For those companies working on more robust responses, my colleague Mike Tuffrey cautions that business should beware of the ‘curse of materiality’ – selecting the Goals that are most relevant to the business and doing more of the same activities. Materiality, he says, is a curse if it closes down thinking. SDG mapping and indexing tools don’t take us much beyond what we did with the Millennium Development Goals. 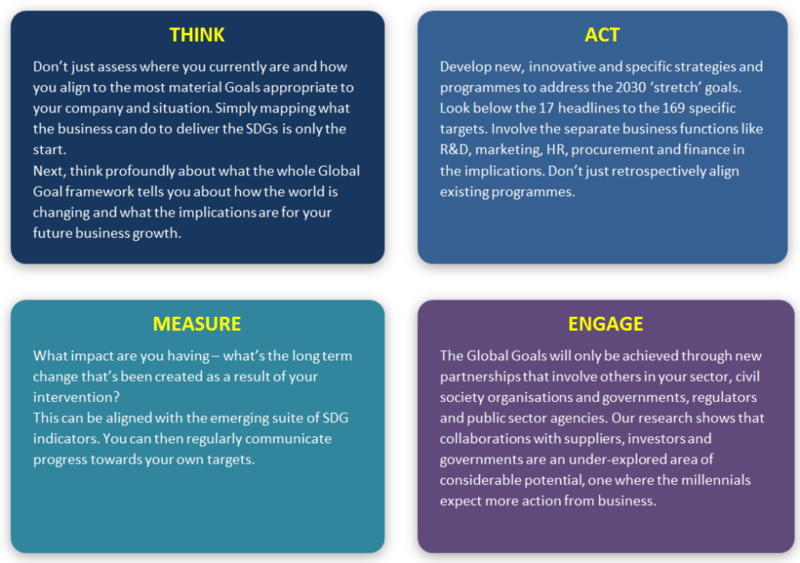 Our paper presents a four-point plan to help business think about how to effectively contribute to the Global Goals, whilst bridging the gap between expectation and action. As we say in the report – without business stepping up to do more, we simply cannot create the world of zero poverty, zero hunger and zero emissions that everyone would benefit from. Businesses have a huge responsibility and opportunity to demonstrate their positive influence on society. Nana Guar is a Senior Consultant at Corporate Citizenship. This post is republished from the Corporate Citizenship blog.